Tank setup: Piles of rocks, with sand substrate. Efficient filtration required. 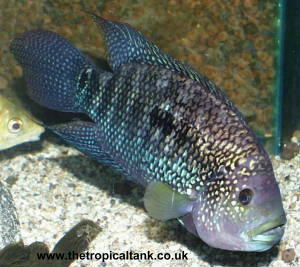 Compatibility: Not for the community tank, keep with similar sized Tanganyikan cichlids. 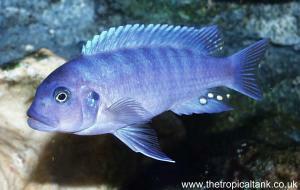 Do not keep more than one species of Julidochromis together, except in very large tanks. 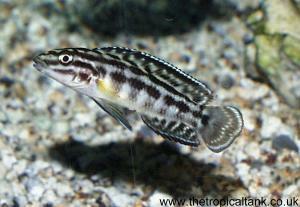 Feeding: Micropredator, feed flake, granular foods and frozen or live foods. Sexing: Males have a noticeable genital papilla. Breeding: Cave spawner, use smooth rocks or plant pots for the spawning cave. The eggs and fry are guarded by the parents. 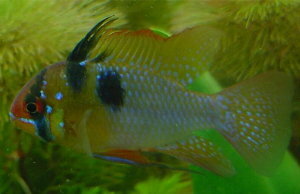 Comments: As with other Julidochromis, the parents may be prone to a violent 'divorce' following disturbances, so take care not to disturb the spawning site, or remove fry too quickly.